FACT: The only Blackjack solution you should consider for playing online, is Live Dealer Blackjack at an online Live Casino. In my opinion, there is no viable alternative. Blackjack is designed to be played with Real Cards that are shuffled and dealt by a dealer at a real table. So why would you not play with someone that you can interact with in real time? It’s a no-brainer, online live Blackjack with a live dealer is almost as good as playing in a real bricks and mortar casino. Before you go off and play there are some subtle differences between the live dealer solutions that you should really know about. They can make a big difference on where you choose to play. 7 seat Blackjack – Where 7 players can play at one table. Sometimes you’re able to occupy more than one seat on the same table (multi-seat). At busy times it can be hard to get a seat at the low to mid stakes 7 seat tables. So I’d advise choosing a casino that has dedicated tables. Unlimited, Infinite or Common Draw Blackjack – where one or more player hands are dealt that an unlimited number of players can bet on. This is used mainly as a solution for players who can’t get on a 7 seat table who still want to play. Then there’s the number of decks in play. They can differ from 6 – 8 decks games. Some games have European or Vegas Rules (where the dealer takes one or two cards in the initial deal). Playing options during a hand can be different so it can affect your ability to raise your bet at key points in the hand. You may be able to play some, all or no Blackjack Side Bets. From a Return to Player (RTP) perspective the providers would have you believe, nothing. Standard RTP (Return to Player) is 99.5% although Evolution Gaming publishes 99.28%. But for me it means everything. Small things like being able to double without restriction can make a huge difference to the amount you can win/lose on a hand. Being able to improve your bet as the hand unfolds through splitting and doubling is a key component of the game. I for one don’t like this to be restricted. Everyone is different in what they like. I have the perfect game for me and it’s at Royal Panda. 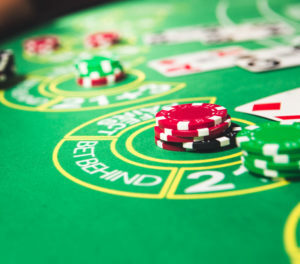 I’ve compiled a list of my favourite live dealer blackjack casinos for each of the software suppliers, with the major Blackjack game features listed. You can compare live casinos and choose what’s best for you. As I’ve mentioned before not all live blackjack games are the same. There are some common elements. All online live dealer Blackjacks pays 3:2 for a BJ and Insurance pays 2:1. That’s pretty much where the common elements end as each of the Live Casino platforms providers has developed their own playing rules. There’s a full rundown and comparison of each of the rules on my Blackjack Features page. It also contains a complete list of the casinos where you can play that particular software. There are generally two versions of live dealer blackjack. This is the more traditional game where there are 7 playing positions on a table. You play with other people and it’s essentially the same game you’ll find in land based casinos. You place your initial bet and the live dealer deals everyone two cards. Depending on the rules (European or Vegas), the dealer will take one or two cards. Each player takes it in turn to play their hand, until they either stand or bust out. The dealer is the last to play his hand. When his hand is completed it’s compared to all the players hands and those beating him will be paid out. There are some obvious issues with 7 seat Blackjack, especially when you’re offering it to an almost unlimited number of players over the internet. They put on more tables – this becomes expensive as the tables need space and more dealers. Some of the solution providers like Evolution have 100’s of tables across a number of studios to meet the player demand. These tables are shared between casinos so are often very busy during the evenings. They get the online casino to purchase dedicated tables for their players. The environments are branded for the casino and only their players can use the tables. This is very effective from a players point of view as you can normally get a seat at one of these tables. Obviously, it’s more costly for the casino. The Bet Behind functionality allows players without a seat the opportunity to place a bet behind one of the seat positions on the table. The hand is played by the seated player. You take no part in the playing of the hand. It’s a risky thing to do so if you’re tempted to play this you should pick a player that seems to be having luck and is using standard basic strategy. 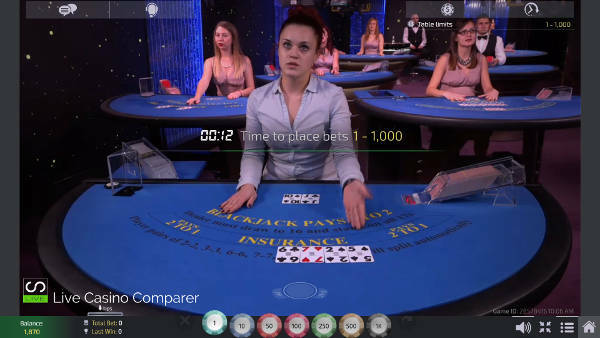 (Some suppliers have added a number next to the player to show the number of consecutive winning hands to help you decide who to bet behind). Have another game of Blackjack that solves the problem of volume – meet Unlimited or Common Draw Blackjack. When a split occurs you’ll be given two options. To split the hand – doubles the bet and you play two hands. If you don’t want to Split then you must Fold the hand – with this option you’ll get a portion of your original stake back. The Dealer does not check for Blackjack. They may be one or more player positions – an unlimited number of players can play each position. Playtech, Netent and Visionary iGaming casinos all have versions of Unlimited Blackjack. This is where you’re allowed to play multiple seats/hands on the same 7 seat table. You’re often restricted to the number of hands you can play. At busy times the casinos will switch off this function. You’re able to play multiple tables at the same casino at the same time. A number of the game interfaces have a multi-table capability where you can display up to 4 tables at one time on your screen. Playing at multiple tables can be an acquired taste so I suggest you try using the layout before committing yourself. I find it too stressful and only play one table at a time. Special side bets can be played alongside the main hand and are offered by most, if not all the software providers. The reason not everyone has them is down to licensing. It’s costly for the casinos to have them. The most prevalent side bet is Bet Behind, where you can place a bet behind another players cards. He plays the hand and you are betting that he will beat the dealer. This is quite popular if you’re either waiting for a seat at a table or there is a player on a hot streak that you want to benefit from. Then there are Perfect Pairs where you place a bet that either your hand or the dealer’s hand will be a pair. I’ve seen this executed brilliantly at the Empire Casino in Leicester Square, London. The lady sitting next to me must have drawn 4 sets of pairs on the bounce. Guess what? I was the only one on the table not betting on her hands, Doh!!! 21+3 or Rummy side bet. You bet on your first 2 cards and the dealers up card being a poker hand, such as a flush, 3 of a kind or a straight etc. Watch out for the payouts as they are different at some of the live casinos. Most notably Visionary iGaming casinos pay a blanket 9:1 on the 21+3 side bet, regardless of the winning hand you have. Other suppliers will pay up to 100:1 depending on the hand you get, so make sure you know where to get the best side bet odds. The RTP for standard Live Blackjack is 99.5%. As games go this has the best RTP of any casino game out there. Remember though that this figure relates to games played from over 100,000 hands. You should not use this as an indicator that if you have £100 and play 10 hands at £10 you’ll end up with £99.50 after those 10 hands. It just doesn’t work like that. European Live Dealers – Who speak in English or their native language can be found at Evolution, Extreme Live Gaming, NetEnt, Media Live, Lucky Streak, Playtech and Ezugi Casinos. Latin Live Dealers – Who speak in Spanish and English can be found at Ezugi, Global Gaming Labs, Vivo Gaming, Xpro Graming and Visionary iGaming Casinos. Asian Live Dealers – who speak in English and Chinese can mainly be found at Playtech casinos. You can’t underestimate the dealer’s role in providing a great playing experience. I’ve spoken to a number that works at live casinos. (check out my Inside Live Casinos section for my interviews with live dealers). All of them mention the players and the on-screen relationships they build with people, many of them refer to players as their “friends”. I love live dealer blackjack it’s my favourite table game. I’ve learnt through trial and error that there are many different things that make up a great game. The casino who host the games. I’ve also learnt that I like to change where I play dependent on my mood. I’ve collected a lot of information which you can use to make an informed choice of where to play. If you don’t want to play then hopefully you’ve learnt something that you didn’t already know. You can check out my live casino reviews or my individual Blackjack reviews for Playtech, Evolution, NetEnt and Extreme Live Gaming for more information. If this is all too much and you just want to play at a great live casino then Leo Vegas and Royal Panda are my picks. You can also play live blackjack for free at Fairway live casino to practice your skills.